Hi! I’m Courtney from Sweet C’s Designs, and I am so excited to be over here on Bombshell Bling today. I actually went to high school with Sarah and helped get her into blogging- and I am thrilled to be here contributing to her S’mores Saturdays. If you haven’t already figured out, Sarah has a MAJOR s’more obsession- and so do I! 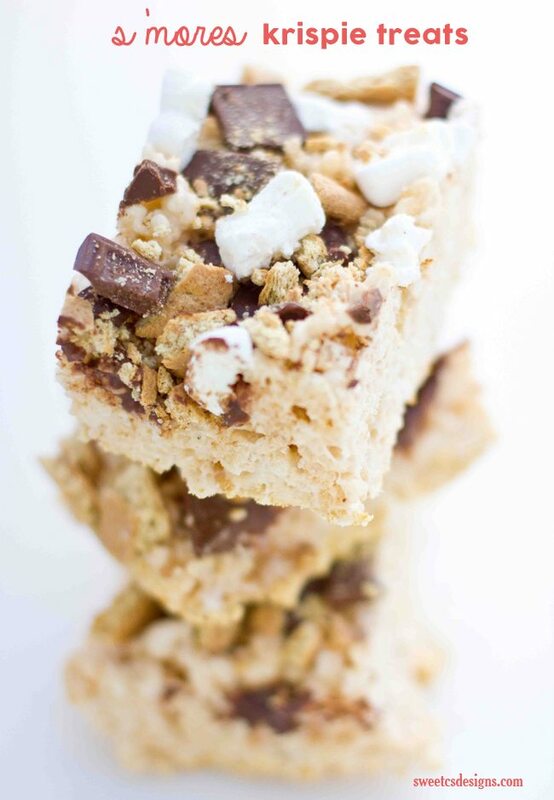 I decided to make some fun s’mores krispie treats to celebrate the fun of summer- and I’m also sharing some s’mores monkey bread over on Sweet C’s today as well! There really is nothing better than s’mores in summer, is there? 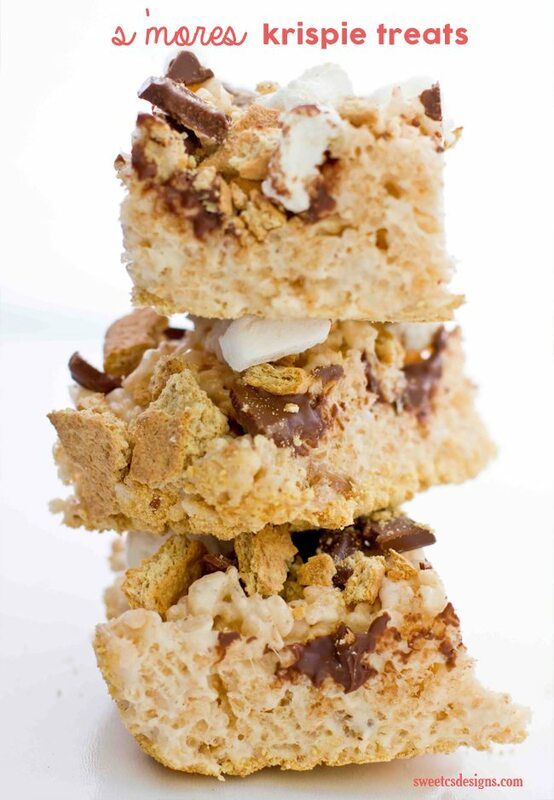 Well- I also LOVE making rice krispie treats in summer. 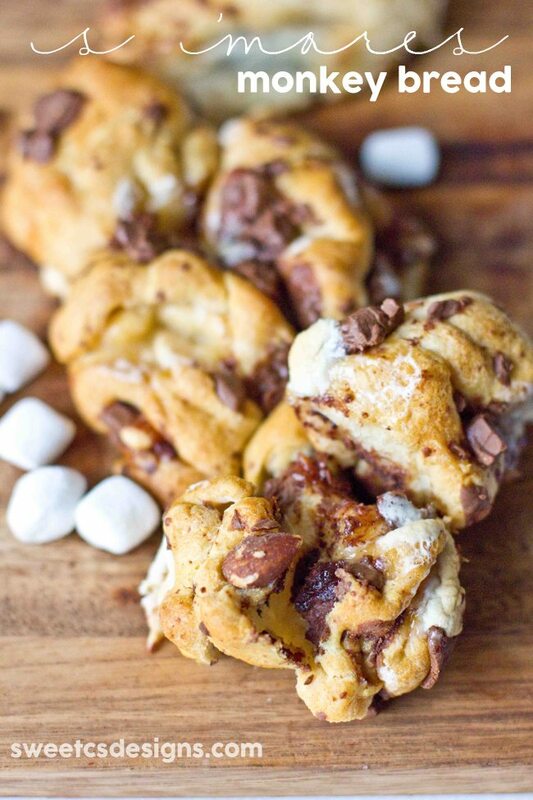 They are the perfect sweet treat that don’t weigh you down completely, and they are so easy (like s’mores) to put together- so you can get back to all that summer fun! These would be a great make-ahead for camping, a fun treat for VBS, or just an any night indulgence. I hope you love them as much as I do! Add 4 cups marshmallows and stir until completely melted. Remove from heat. Add rice krispies, graham crackers, and chocolate crumbles. Mix until well coated. Just before adding into the dish, stir in extra ¼ cup marshmallows.